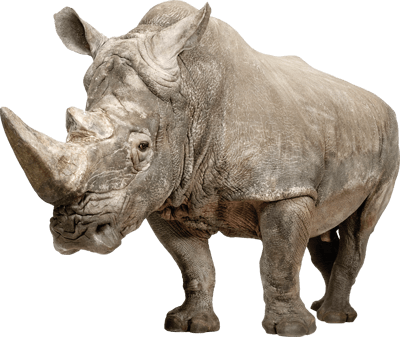 The word "rhinoceros" comes from the Greek words "rhino" meaning "nose", and "keras" meaning "horn". Its horn is not bone but is make of the same material as human hair and fingernails. A group of rhinos is referred to as a "crash". 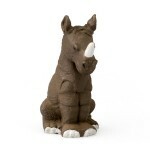 Print the White Rhino Character Card! White Rhino horns grow as much as three inches every year, and have been known to grow up to five feet long. White Rhinos are surprisingly agile and can run very fast, up to 40 km/h for short periods. A Whote Rhino is one of the oldest land mammal species in the world.